A luxurious afternoon tea for two at one of Red Letter Days' hand-picked venues (including a range of chic hotel restaurants, cocktail lounges and tea rooms) is an opportunity to get spoiled. 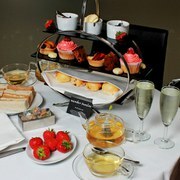 Whichever venue is chosen, the delicious afternoon tea will often include a special extra, such a glass of chilled champagne or cocktails. 'There are few hours in life more agreeable than those dedicated to the ceremony known as afternoon tea' said Henry James, and who are we to disagree with this glorious way to spend an afternoon.